Slap and Giggle – aka Sid Wick and James Bennison. Manchester based double-act specialising in character comedy word play, musically inept song, and trademark bizarre dribble. A true entourage of alternative surrealism, and desperate popularity contests. Slap & Giggle run its own night in Manchester, and is a firm student favourite, promising a freshly written show every week, as well as doing hour long festival shows and shorter sets for other clubs. Slap & Giggle were chosen by the BBC to perform as part of their ‘Comic Relief’ Red Nose Day campaign in 2009. 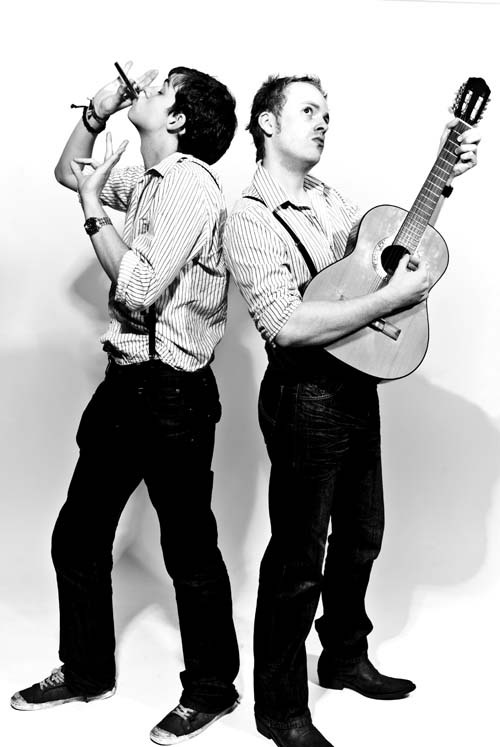 Sid and James are currently gearing towards the Edinburgh Fringe Festival 2010, as well as developing a full album of their high in demand “unrecordable” songs. Slap ‘n’ Giggle distinguishes itself by maintaining an element of surprise with its varied structure, incorporating stand-up, sketches, songs and silliness… Daft as hell, thoroughly recommended.